Little Vampires: The Man Behind The Woman | "I'm Not The Artist"
San Diego Comic-Con, Phoenix Comicon, WonderCon, STAPLE!, Emerald City Comicon, Calgary Comic and Entertainment Expo, Sac-Anime, ScareFest, Alternative Press Expo, Long Beach Comic Con, Wizard World Anaheim, Dallas Webcomics Expo, Bakersfield Comic-Con, many more. What’s your role in Little Vampires? To what degree do you provide creative input? 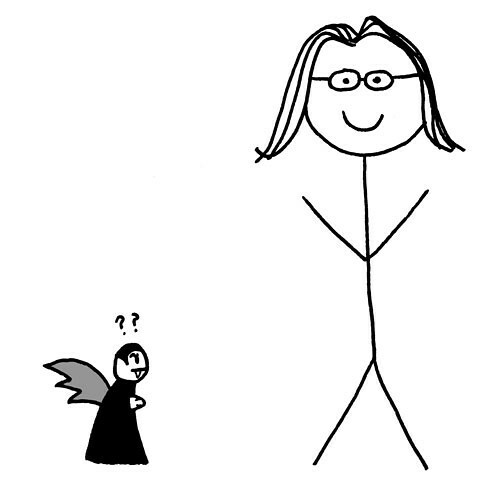 I don’t usually provide direct creative input on the comic itself, though sometimes we will bounce ideas around. I mainly do behind-the-scenes things like merchandise preparation, inventory, paperwork. I make the glass refrigerator magnets we sell, and when we do the occasional limited-edition hand-bound book, that’s me too. I’m responsible for packing and keeping track of our inventory when we travel to shows, and for making travel arrangements. I also keep our website running smoothly. Do you attend every convention with Rebecca? I attend almost every convention, something like 15-20 shows a year. Once in a while I’ll skip a Friday on a local 3-day show to conserve vacation days from my day job, and she has done a few events in Kentucky solo, but with support from her family there. Sketch of Rebecca by James Hicks. That happens a lot less now than it did in the beginning. When we were just starting out, I was frequently approached first by people coming to the table. I’d redirect folks by saying something like “She’s the talent, I just lift and carry things.” Then people would generally laugh and start talking to her. 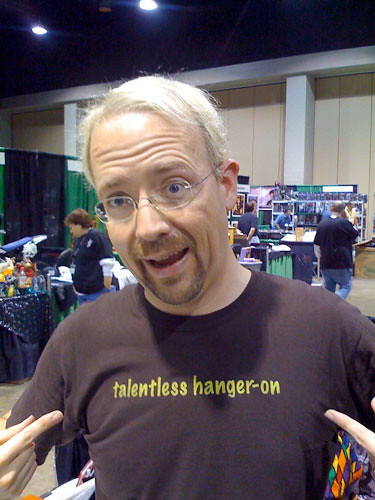 Eventually, I made t-shirts for myself that say “talentless hanger-on,” which I now wear at every convention. That usually does the trick. The shirt was such a hit that we ended up making it into a successful product. We both stay at the table as much as possible. I go to make coffee runs, grab lunch, and run general errands. I sometimes man the booth solo when she needs to get out and walk around, or has an errand of her own to run. We both feel like we’re better at running the table together than individually, but it is nice to know that we can take a break to run to the restroom, get a snack, or whatever, and the table will be in good hands. We definitely work together in pitching the product. When it gets hectic, we sometimes independently engage with different customers, but we more often play off each other, like a webcomics Sonny and Cher. Doing so many shows together, we’ve developed a sort of natural banter between each other and the customers at the table. I’m very lucky with my job to have a lot of days off available to me, and she does this full-time, so it’s not generally a problem. That said, we do sometimes have to pass on events we’d like to do if the time off doesn’t work out for me. Do you and Rebecca have a special code or signal at the table to signal something important? We don’t really have any specific codes, but after seventeen years of marriage, sometimes people accuse us of just being generally telepathic. 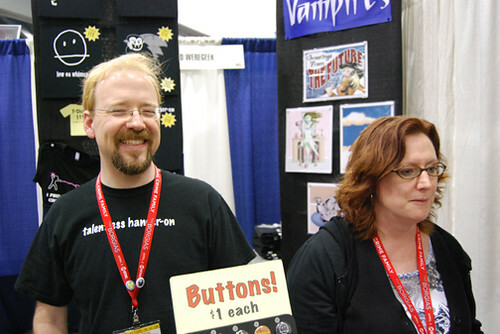 Working together at conventions so frequently has made us pretty fluid in our cooperation, and able to anticipate each other’s needs behind the table, mostly. How has working together on Little Vampires affected your relationship? We were together for a long time before Little Vampires started, so our relationship was pretty well-established before that. I think working together on this project has made our relationship even stronger, and has really given us a great outlet to just be encouraging to each other. There are lots of things we’re both doing now that we never thought we ever would or could do before, and a lot of that is due to just telling each other to go for it and being there to cheer each other on. What do you do besides helping out with Little Vampires? My “normal job” is as a software engineer. That technical background has really helped out in a lot of aspects of what we do, from maintaining the website to keeping an inventory database. In our spare time, we tend to play video games together. Lately we’ve been playing Lord of the Rings Online and the cooperative mode of Portal 2. Cliche as it sounds, communication is key to making it work. Make sure you have a clear idea of who’s responsible for doing what, and who has final say over which area. Having a sense of humor about things and being willing to improvise your way out of a problem instead of trying to figure out blame is important too. The first time one of you has to say “I thought you filled out that form,” you’d better both be ready to think of a way to fix it, rather than try to figure out right then why it needs fixing. Figuring out why, and more importantly, figuring out how to make it not happen again, is a job for the both of you later.